● Banish 1 Zombie monster from your GY; the Normal and Special Summons of your Zombie monsters cannot be negated for the rest of this turn. ● Target 1 Zombie monster you control; banish it, then you can send 1 Zombie monster with 0 DEF from your Deck to the GY. Shiranui Squire, Shiranui Spectralsword Shade, and Shiranui Swordmaster appear in this card's artwork. 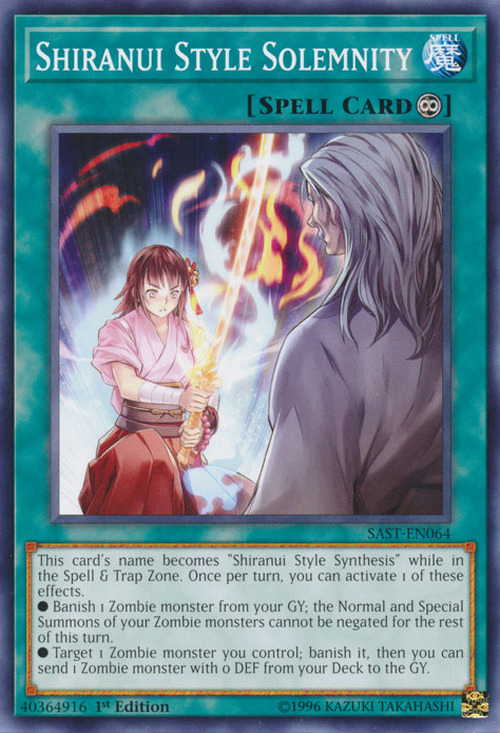 This card may be depicting the transformation of Squire into Shiranui Squiresaga.